Hatters midfielder Pelly Ruddock Mpanzu believes it is vital that his side finally get their noses in front once again when they host League Two’s basement side Dagenham & Redbridge this evening. 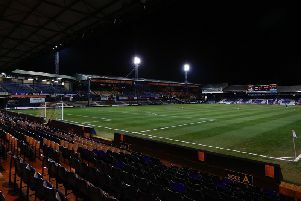 Luton go into the match on the back of a run of three straight defeats in front of their own supporters, with another home reverse at the weekend, beaten 2-0 by Accrington Stanley. Ruddock Mpanzu said: “It’s vital to get the first goal, we haven’t scored got the first goal in a while, so if we get the first goal, I think we can move other teams, but it’s vital to get that first goal in my opinion. “We missed chances on Saturday and if we’re 2-0 up and score those goals then I think the second half is a lot easier. “We might get a third or fourth, but that’s how football goes. We’re 2-0 down and it’s hard to get back in the game, but we carried on going. Ruddock Mpanzu is hopeful of remaining in the side for tonight’s clash too after impressing at the weekend, as he continued: “I feel good, I’ve been patiently waiting my time and thought hopefully I put in a good performance and can move on to Tuesday. Despite the weekend’s defeat, Ruddock Mpanzu felt there were positives to be taken too, saying: “We moved the ball brilliantly first half, created a lot of chances, we opened them up, Josh (McQuoid) had a chance, Jack (Marriott) had a chance, we just weren’t clinical enough. “Second half, they got an early goal and put us back, but we carried on going. On what boss Jones said to the squad afterwards, Ruddock Mpanzu added: “He just said it was disappointing that we didn’t come away with the result. “In training he said play with a high tempo and high energy and he thought we put that right, but we didn’t win the game.